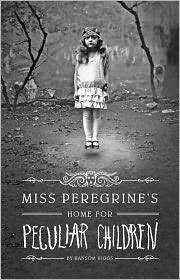 The best way to start talking about Miss Peregrine's Home for Peculiar Children by Ransom Riggs is just to say that it's a haunting, imaginative, gripping adventure. Jacob is a typical teen who doesn't get along with his parents. He has always gotten along with his grandfather, though, and when he was a little kid his grandfather's tales of growing up on a secluded island in the UK fascinated him. His grandfather would tell stories about girls who could float, boys who could lift huge boulders without any difficulty, and kids with many other magical abilities. He also had pictures to go with these stories (which are scattered throughout the book). By the time Jacob is a teen he starts thinking his grandfather is crazy and the pictures are doctored, but his grandfather's sudden death and cryptic message to Jacob start making him question things he long stopped believing. His mission to understand the cryptic message takes Jacob on an adventure to the island in the UK where he meets a variety of people and crazy, unbelievable things start happening to him. He also learns a lot about his grandfather and his parents throughout the trip and he starts looking at his and their lives differently. The addition of the photographs is one of my favorite parts of the book. The photographs Jacob's grandfather shows him, and others Jacob later recovers, are described in vivid detail and I could easily picture them in my head, but turn the pages and you'll actually see them in the book. Seeing them makes them even more real and more haunting. I thought they were created specifically for the book, but I was even more pleasantly surprised to find that the photos are real and were part inspiration for the tale. This was a fabulous book. It's hard to write about, though, because the plot twists in so many ways and I don't want to give away all its secrets. Just know it’s part family drama, part horror, part fantasy, part adventure, and I loved it. I thought it was a standalone novel, because while the ending isn't neatly wrapped up, things are resolved and I felt hopeful for the future. But I just found out that it will be the first in a series. I hope the rest of the series is as adventurous and exciting as this one.